Finding and using the right tools can make all the difference to your landscaping project. Do you want to lay turf or cut the grass? Do you want to chip wood or break up the soil? Our landscaping tools for hire are the best way to make your project easier. Turf cutters are one of the easiest and most efficient ways to remove large areas of turf from your garden in preparation for landscaping projects. 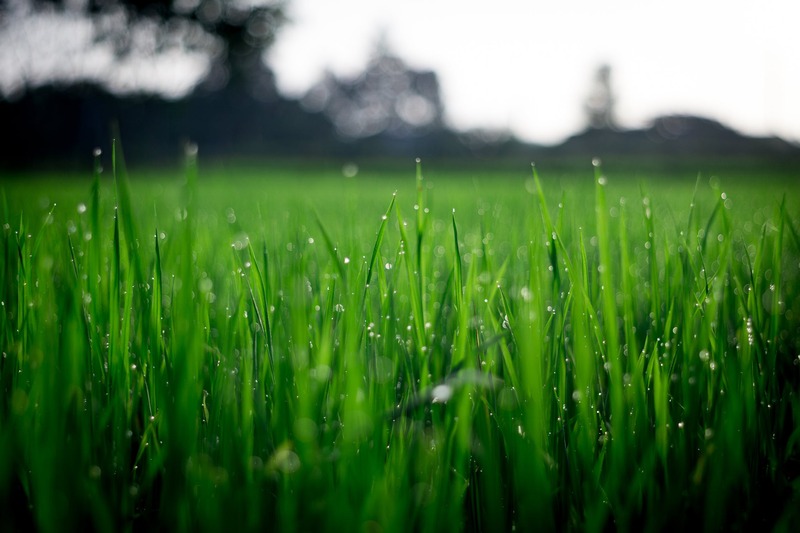 Turf cutters work by removing the top surface of your lawns by cutting consistent strips of the turf away. This is done effortlessly, leaving your lawn ready for re-turfing. The turf cutters we hire feature a powerful engine and variable depth setting that is suitable for a wide range of lawns. Do you have a pesky tree stump in your garden? A stump grinder is the perfect power tool for removing tree stumps. They work by rotating a cutting disk that rapidly chips away at the wood, turning it into sawdust or mulch material that is great to use on your garden. A tree chipper or wood shredder is used for reducing any wood in your garden (generally tree limbs or trunks) into usable wood chips or sawdust – perfect for surfacing your flowerbeds. Chippers are shredders work by pushing trees or wood through two separate chutes. The first chute, the smaller out of the two, shreds the branches into chips. The second chute has multiple blades and hammers that work the wood chips into mulch. Mowing large garden landscapes is a job for a high-quality and reliable lawn mower, such as our powerful rotary lawn mower. With an adjustable cutting deck, our rotary lawn mower is ideal for restoring overgrown lawns and the height can be adjusted to perfect your grass cutting. What’s more, our rotary lawn mower has a collection box at the back to avoid the problem of grass cuttings falling on your freshly mown lawn. You can empty out the rear collection box and tip the clippings onto your compost. If you need to prepare a large area for sowing and planting, hiring a rotavator can make the job significantly easier. We hire a petrol driven rotavator tiller that is used to lift and separate soil. It works by using a set of blades or rotors which spin and break through the soil. Absolutely ideal for large areas of ground, the rotavator is both labour saving and incredibly easy to use. When preparing your garden for planting or simply tidying it up, it is important to have the right tools. 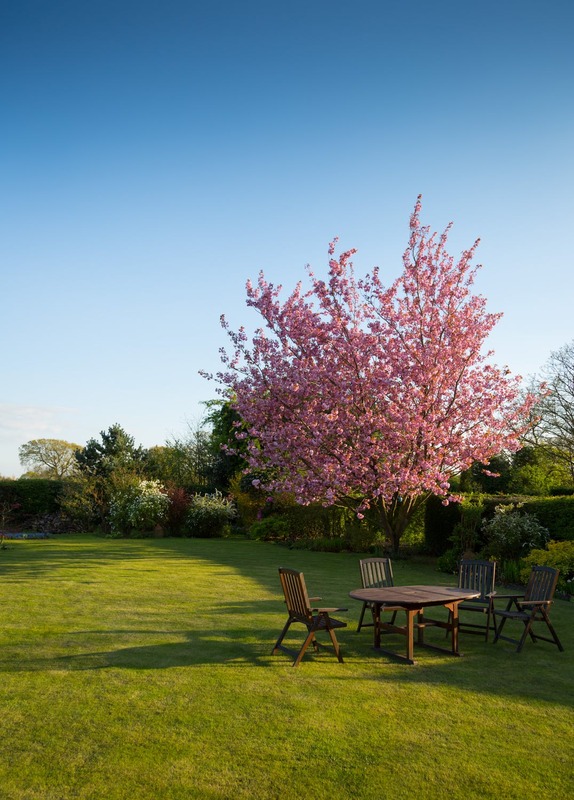 Whether you are a very experienced gardener, or you just want to clear your outdoor space, having the right tool to hand can make garden maintenance a breeze. So, we thought we’d list the best landscaping tools you’ll need for planting and digging to make the job easier. Round Point Shovel: this shovel is great for lifting, digging, and throwing excess soil. The round section of the shovel cuts into the soil, while the rim on the top of the shovel blade allows for added pressure to be added when digging holes. Square Point Shovel: this shovel is excellent for moving materials and the larger size is known as a scoop. Shovels are easy to store in your car and are ideal for working in both large and small spaces. 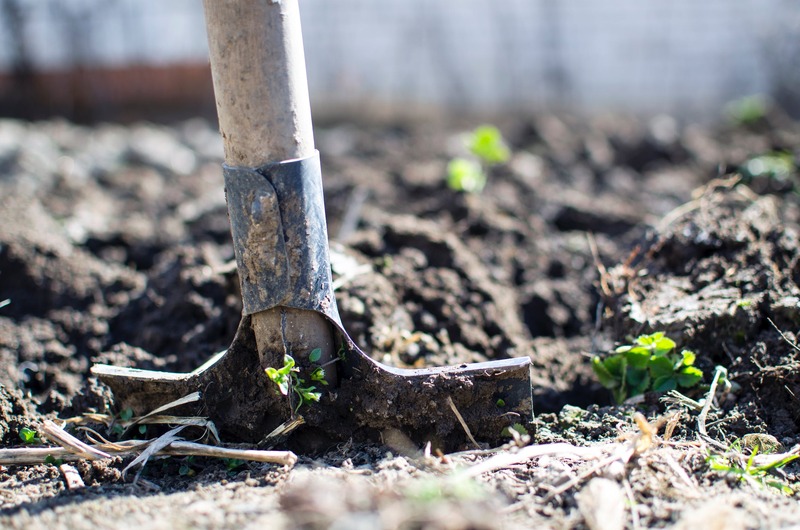 Digging Garden Forks: these garden forks are perfect for the heavy job of digging and help loosen heavily compacted soil. Border Garden Forks: these are a slightly smaller option than digging forks. However, the smaller size of border garden forks makes them ideal for more confined areas where a larger tool could damage plant root systems. Garden Hand Forks: these are perfect for more intricate gardening work, such as turning over the soil in flower beds and removing weeds by the root. Hay Forks: this fork is useful for moving hay, compost, and mulch. If you need to move large amounts of material, a hay fork is the perfect choice. Spading Fork: this gardening tool has flat tines that are ideal for turning soil, separating perennials, and lifting up bulbs and other plants. If you want to use a fork that is less jarring to use than a shovel when digging in rocky or hard, compressed soil, the spading fork is the ultimate choice. You can also use a spading fork for loosening and aerating soil. This is a long-handled tool that has a sharp blade on the end that, when pushed through the soil, cuts the root system of weeds to prevent them growing back in the future. Dutch hoes are ideal for loosening soil and removing weeds. What’s more, if you use this tool regularly, it will keep the soil moving and this will help prevent any new weeds from forming. Used to spread soil evenly over an area and also to collect debris you want to remove from your garden, soil rakes are a versatile tool. There are three types of rakes that are essential to maintaining garden landscaping: a leaf rake, a hand rake, and a bow rake. Leak Rake: helps to clear up leaves, sticks, and other light debris. Hand Rake: Ideal for small sections of land, a hand rake is perfect for working in tight spaces as it allows you to smooth over the soil in smaller areas, such as around flowerbeds, without disturbing your plants. 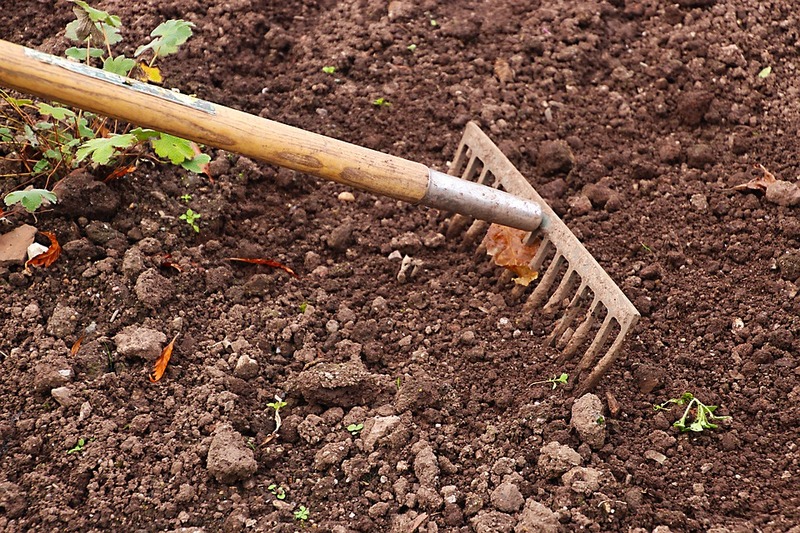 Bow Rake: a bow rake is used to break up dense soil and spread it around the garden. Called pruning shears, hand pruners are tools used to trim and clip vegetation and keep hedges, trees, and shrubs looking clean and tidy. They work just the same as scissors do except that they are strong enough to prune hard branches off trees and shrubs – sometimes up to 2 centimetres thick! Having a good wheelbarrow is essential for any garden or landscaping project. Strong and yet light enough to easily transport soil and rubbish when full, wheelbarrows are great for transporting debris, soil, and even tools around your garden or over larger landscapes. This tool is more of a luxury gardening and landscaping item, until you need one that is. Post hole diggers are ideal for letting you dig deeper holes and with more precision than a shovel. Don’t use the wrong tools for the job! Click here to check out our article on the best tools for your landscaping project.